My daughter stands a little over three feet tall, even in my red-heeled, cowboy boots that reach up to her thighs. She clunks around the kitchen, toes pointing outwards like a witch because she's put them on the wrong feet. "I'm Stevie," she says, with a grown-up air of importance. "If you're Stevie, then who am I?" It's one of her favorite games: she's the adult and I'm the three-year-old. "I love you Soleil!" she says. "I love you Mama!" I reply. When I was little, I wanted to be my mom, but I don't think she ever imagined what it was like to be me. I remember wearing her tall brown riding boots and running around the coffee table, trying not to trip, as my stepfather reached out to tickle me each time I passed. My mom lay on the floor by his side, teasing, "He's gonna get you, get you, get you, get you—one way, or another," like the Blondie song. It's a good memory, one of the few I hold onto. I have other memories, though, that can't be reconciled with the soft face before me. I search Soleil's big brown eyes as she pushes a stubborn curl back and wonder, was I as tender and unsuspecting at her age when that happened? It was past my bedtime, and we'd just come home. Cranky and tired, I threw my red and white zip-up sweater at the foot of the stairs and refused to pick it up. My mom beat my head and pulled me up two flights by my hair, all the way to my room where I cried myself to sleep. In moments like those, overwhelmed by fear and confusion, I'd retreat inside myself, a blubbering larva wrapped in a cocoon of snot and tears. On another day, I ran into my parents' room to tell my stepdad my banana was brown and yucky, but I struggled getting the words out. He slapped my face for wasting food before I could tell him I was a good girl—I'd eaten it anyway. Sometimes I enjoyed getting lost in the rhythm of my wails and licking the sweetness pooled at my upper lip, but this time I was too stunned to cry. "Tell me what you did," he demanded. I knew I should respond, but my mind, rather than my bowels, had emptied in a panic. He half-heartedly whacked me again with his heavy hand and I fell over like a buoy, hitting the floor before slowly rising back up. "Tell me what you did." And on this went, the buoy going down, again and again, until finally, he asked for a hug. He always needed a hug afterwards. My mother never needed a hug. I was hers and she didn't question her right to power, although I eventually did. When I was 15, emboldened by an after school special, I firmed up my voice and requested she not hit me anymore, especially not on the face. It made me feel worthless, "like dying," I said, not entirely for dramatic effect. In response, I felt the sharp sting across my cheekbone. "I'm the mother. You're the child. You don't tell me what to do." Still, she didn't like my stepdad pushing his weight around. When he'd hit me, she'd put on a show of yelling at him; sometimes she'd even kick him out of the house for a few hours, but by the end of the day, the fault was firmly placed back on me. I asked for it. I wanted it. I bruised like a peach. She was never protecting me, only her dominion. I left on my 18th birthday with two faded black eyes and a matching trash bag filled with clothes. Knowing my escape would be tumultuous, I'd surreptitiously rented a small guesthouse in the neighboring beach town and gave no prior signs of my coming departure; I hadn't even packed for fear of being discovered. As a friend helped me load her red pick-up truck with the meager belongings I could grab in the moment, my 11-year-old sister holding tight to my leg, begging me not to go, my mother quickly re-engineered the story, placing herself back at the helm: "You're not moving out. I'm throwing you out!" She hurled my books and journals on the front lawn, as if to anchor her version of a drifting reality. A month later, my mom deigned to enter the restaurant where I'd been working as a waitress for the past year. It was one of those family chain restaurants, a cornerstone of Southern Californian suburban sprawl that offered free refills, early bird specials, and pies to celebrate every season. My arms were loaded with dirty plates, fanned out like porcelain wings when I saw her. "Look at you," she hissed. "Working in this white trash diner like a cheap whore—I abort you." It was a Friday night and my manager had given me the busiest station so I could make some extra money. Even though my co-workers had started a collection, bringing in a table, chairs, and a broom for my tiny new house, I still needed to pay for tuition and books on top of rent. My arms began to furl under the weight of shame and greasy leftovers, but I held my mother's stare until she turned and left. And then I carried on like nothing had happened. On my break, I went to the bathroom and did a big rail of crystal meth. It had become my thing, a secret way to take flight. I loved the stinking burn in my nostril, the sting in my brain. I gagged and my eyes watered, but I wouldn't cry. This was a pain that finally made sense. When I got clean years later—by then I'd graduated to shooting heroin—my recovery sponsor made me frame a photo of myself as a baby. "Before you think of hurting yourself, look at the picture," she said. I obliged but didn't see how that would help. I stared at the black-and-white photo and felt nothing. When I saw pictures of me as a slightly older child, with dark circles under my eyes and mousy, unkempt hair, I felt only disgust and hatred for my weakness. I never even raised a hand in my own defense. Watching my daughter study me, adjusting her movements to match mine—a tiny hand on the hip, a toss of the hair—I imagine her terror if I were to turn on her. I feel the confusion she'd feel of wanting to be like me and loved by me, coupled with the anxiety of not feeling safe with me. I see her overwhelming desire to please me—her inborn trust and compulsory devotion. How could I fault her this vulnerability? How could I fault my own? With my child, I find the compassion I've denied myself for so many years. I finally feel tenderness for little Stevie, just over three feet high, with boots up to her thighs. "Do you want to help me make dinner?" "Yes!" She's always game for a mess. "Okay, you can make the mushy gushy!" She has no idea what mushy gushy is, but the sound of it is promising enough to make her chant, "Mushy gushy! Mushy gushy!" as I prepare small cups of flour, water, and sugar—whatever I can find in the cupboards to keep her busy while I cook. I haven't spoken to or seen my parents in years, but occasionally I send them emails to honor the good memories. It's a small gesture, a message in a bottle tossed from a safe and distant harbor. I began this practice after my daughter was born on October ninth, the same day as my mother's birthday. When I realized I was due in October, I prayed my daughter wouldn't be born on that day. It was irrational, but I feared a combination of genetics and calendar alignment would lead to Narcissistic Personality Disorder. I feared that my daughter would suffer the same self-referential loneliness as my mother, and I would be denied her love too. Yet, the second my baby blindly rooted for my breast, I realized my fear was more about me loving her. Her devotion was a given, as tangible as the soft spot on her slick head; it was mine that came roaring back as a terrifyingly visceral surprise. Each time she suckled, my vacant womb squeezed like a medieval vice, drawing itself back together after 36 hours of tearing labor. Intellectually, I understood the process: nursing triggers the release of oxytocin which both lets down milk and contracts the uterus, while bonding mother and child with a kind of hormonal superglue. But the pain! No prenatal class could've prepared me for it. The pain was so unexpected and utterly complete, my toes curled. I had to fight the urge to pull her off me. I thought in that moment I'd feel like a kid again—unfettered, awash in love— but surrender is so much heavier and existentially aware than a child's blind abandon. Indeed, it's not as if I gave birth and forgot the terror of knowing abuse and betrayal—it's that I knew no matter how much being a mother might hurt, I'd bear down and love wholly again in spite of it. This mother's love had flayed me open and left my heart nursing on the outside of my chest. What else could I do now but let her suckle? I emailed a picture of Soleil making mushy gushy to my mom. Stuck in her world of one, she replied with an old black-and-white photo of herself as a child, standing at the edge of the woods with a big pot full of mud and a ladle in her hand, wearing galoshes and a big smile. It's captioned, "The Original Mushy Gushy Artiste." I stare into the photo and recognize the sweet brown eyes and same stubborn curls, and let myself feel a tenderness for little Elaina, just over three feet high, with boots up to her thighs. I hope, in some karmic way, the love I give to my daughter can heal my mother too. Stevie, This is powerful powerful writing. You've turned your childhood "survival" and pain into brave forgiveness and love. Soleil is learning to make more than mushy gushy from you - she's learning to turn any challenge or darkness into . . . Beauty. I can't wait to read your book. I'm really proud of you girl! ❤️ You are the strongest person I know! I remember those high school days and what you went through. I also remember going to your house and your mom taking me inside to show me a picture of you. She was sick. You've come so far to write and publish this. Love you. What an incredibly brave space you have created and a wonderful amplification of your voice. A very sad and difficult truth combined with unmatched renewal!!! Keep up the work! This is so important. Such incredibly important writing but most of all sharing. I know it's hard, but it is a profound process to put your stuff out there for the world. I had a very challenging relationship with my mother, more mentally abusive than ever physical but it is still quite damaging. It takes immense strength to get past all of that if we ever do... but the point is that it is possible. It took my mother getting brain cancer and the damage that it caused her physically actually caused her to become much more present. She became almost enlightened in that she was only focused on the RIGHT NOW... it was beautiful to witness and in that way it was also forgiving. I loved her more the last year and a half of her life than all the others combined. She had been so consumed with what was, what will and what had not prior to her illness... but then suddenly she was just right there and all that mattered was right there now. I think you will get there. With or without her along for the ride... you are already so close. Hugs to you and your beautiful family... you are amazing. Stevie, I was so absorbed in your story. I always knew from the moment I met you in those giant boots of yours that there was a great Woman, Wife , Mother and of course Writer. I miss you give Soliel a big hug from Troy and I hope Tree is well. You have made the choice of being a great mom to your little girl, regardless of what your childhood was like. I applaud you for that. It sounds like your daughter is connecting with your inner child and letting her know that everything is going to be okay. Thank you precious Stevie for honoring us with your raw and brutal eloquence. My eyes are still swollen. Your tragic yet beautiful story was so moving and vivid. For you to have the ability to transform your tragic childhood into becoming such a loving and devoted mother to Soleil confirms that love always prevails. What a blessing you are to Soleil and actually anyone who gets to share any moment in time with you. I have such fond and joyful memories of being around you enjoying that ferocious and mischievous laugh of yours. And for the love of God, please don't ever stop writing! We need your voice, your wisdom and the ability to share your triumphs! P.S. I can't wait to meet your child of love. Amazing read! So proud of you! What a moving and vulnerable piece! 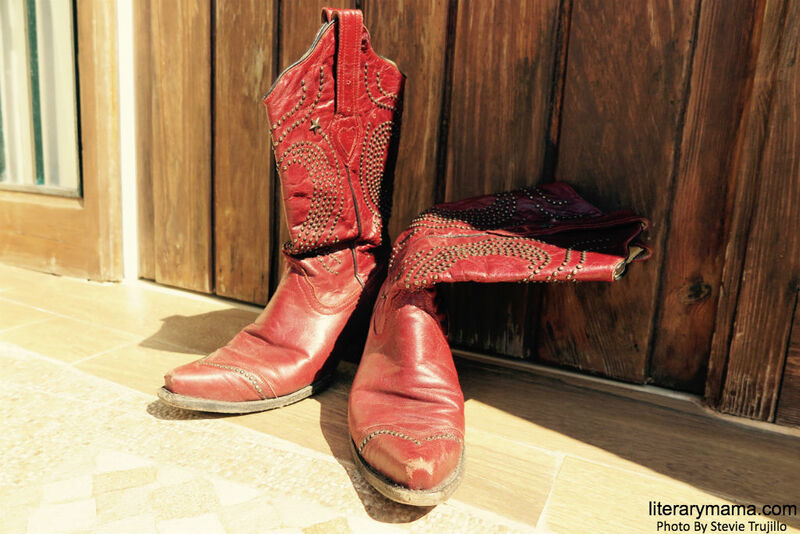 I found myself right in those red boots with you. Thank you for the reminder to have compassion for our deepest wounds and to seek our best selves regardless of our story. Truly beautiful writing. Lovely, lovely work. You've got such a brilliant eye for detail. This is a story I can emphasise with and you tell it beautifullly.Keep writing! Masterfully written, Stevie. You captured so much in every line. My heart broke for this little girl, for the woman who felt disgust and weakness for the child she had been. Later, when she found compassion for herself through her child as well as tenderness for her own mother, I felt hope for all of us- mothers and daughters down the line. Thank you.